Spiritualists believed,in retrospect, that the discovery of gold in California at the beginning of 1848 was not mere serendipity, but the material counterpart of the opening of the heavenly sluices from above when the Fox Sisters began communicating with the spirits. [The party working at Sutter’s Mill was] a cheerful set, working with a will, yet with a touch of insouciance, imparted to some extent by the picturesque Mexican sombrero and sashes, and sustained by an interchange of banter at the simplicity or awkwardness of the savages. In [James Wilson] Marshall they had a passable master, though sometimes called queer. He was a man fitted by physique and temperament for the backwoods life, which had lured and held him. Of medium size, strong rather than well developed, his features were coarse, with a thin beard round the chin and mouth, cut short like the brown hair; broad forehead and penetrating eyes, by no means unintelligent, yet lacking intellectuality, at times gloomily bent on vacancy, at times flashing with impatience. He was essentially a man of moods; his mind was of dual complexion. In the plain and proximate, he was sensible and skilful; in the obscure and remote, he was utterly lost. In temper it was so; with his companions and subordinates he was free and friendly; with his superiors and the world at large he was morbidly ill-tempered and surly. He was taciturn, with visionary ideas, linked to spiritualism, that repelled confidence, and made him appear eccentric and morbid; he was restless, yet capable of self-denying perseverance that was frequently stamped as obstinacy. Up betimes next morning, according to his custom, he walked down by the race to see the effect of the night’s sluicing, the head-gate being closed at daybreak as usual. Other motives prompted his investigation, as may be supposed, and led to a closer examination of the debris. On reaching the end of the race a glitter from beneath the water caught his eye, and bending down he picked from its lodgement against a projection of soft granite, some six inches below the surface, a larger piece of the yellow substance than any he had seen. If gold, it was in value equal to about half a dollar. As he examined it his heart began to throb. Could it indeed be gold! Or was it only mica, or sulphuret of copper, or other ignis fattus! Marshall was no metallurgist, yet he had practical sense enough to know that gold is heavy and malleable; so he turned it over, and weighed it in his hand; then he bit it; and then he hammered it between two stones. It must be gold! And the mighty secret of the Sierra stood revealed! —The Works of Hubert Howe Bancroft, vol. 23: History of California: The Discovery of Gold, pp. 31-32. California, which, for some years after the discovery of gold, became the theatre of all those lawless passions and scenes of violence which ever run riot under such circumstances, might reasonably be expected to manifest the presence of those weird and earth-bound spirits, who, in the first few years of its fevered existence as a gold country, were sent in vast numbers into the spirit-world, through the gate of unnatural death, crime, and strife. The wonderful transparency of the atmosphere, and the heavy charges of mineral magnetism which permeates California, seem to be amongst other causes which peculiarly favor the vision of the seer and the production of powerful supra-mundane phenomena. —Emma Hardinge, Modern American Spiritualism, 439. On whose behalf, then, did one seek to make a fortune? Did one seek treasure to demonstrate to others the truth of spiritualism, or only to acquire personal wealth? Spirits could be unkind to those who sought to turn them to their own advantage. They might be kinder if any wealth found were pledged to philanthropic causes, such as the promotion of spiritualism itself. There was another class that thought they would make their fortunes out of the new philosophy. They would, by its means, discover some secret treasure—a gold mine—and become rich. The spirits knew, of course, all about their selfish matters, and would be willing to hunt up buried pots and kettles filled with eagles and dollars, and ransack mountains for placer. What excellent and knowing slaves they would make! What a glorious thing this spiritualism was! It made men rich! Without a stroke of labor they could procure gold, the instrument with which they could crush and fetter their unfortunate brothers. Yes, it would make them rich, and was really a glorious affair. They were excited about it. Who would not be excited when dollars could be made? They were sensitive, quite impressible—in the pocket, their most impressible part. The bubble burst. Lo! vain expectation! disappointed ambition! They found at last that the spirits did not come into the world to be lackeys for the amassing of wealth. They come not for the aggrandizement of the few, who in the beginning showed how unworthy they were by such selfish and egotistical questions. “If you would have wealth,” they exclaim, in the sweet harmony of the spheres, “if you would have wealth, labor honestly at some useful toil. Do not ask us to help you, or to give you an instrument to enslave your neighbors. Then to the field, the workshop; get you thither, and become useful, and not a drone in this laborious hive.” What a question to ask an immortal being—How make dollars fastest? There are men now who can make them fast enough, quite to the satisfaction of every body. There are men now who can pinch it out of suffering and agony—pinch it until the eagle on it screams. —Hudson Tuttle, Arcana of Nature, volume 2 (Boston: William White, 1864): 56. Clairvoyance could help the seeker search within the earth—made transparent to his or her vision—or make sense of the geological signs on the surface of the earth which pointed “as above, so below,” like hieroglyphics, to subterranean features. Associating spirits with hidden treasure was not new with spiritualists, but continued a long tradition of American folk divination and scrying that included reckoning with the guardian spirits—often Indian or pirate spirits—that protected treasures from unworthy seekers. Such stories of spirits guarding treasure are ancient and worldwide. Mr. K. was persuaded to believe that two little girls in New York could see, by looking into tumblers of water, any hidden treasure, or stolen property, whether buried in the earth, sunk in the sea, or above ground, wherever it might be. By their direction, therefore, he spent all the money he could obtain, to find hidden and lost property, with the strongest confidence that he should obtain immense treasures by these means. All proved abortive, and when he left New York, it is said, he owed for his board. [. . .] It really seems remarkable that one who could not believe in the revelations of the Scriptures, nor even in the existence of God, could believe that those little girls could see the money which Capt. Kidd buried on the North River, and the gold which was sunk in the Huzzah in hurl-gate, in the time of the Revolutionary War. —Trumpet and Universalist Messenger, June 15, 1839. Spiritualist quests for uncovering treasure simply continued the search for spirits to guide humans to treasure, but intensified it, based on the conviction that heaven was hovering close nearby, ready to help those who were prepared to accept their help, and that the earth itself was beginning to give up its treasures—as, perhaps, it was about to give up its dead, in a general resurrection at the imminent Millennium. But who shall know the day of His coming? There were many disappointments. —David Quinn, Interior Causes of the War: 104-105. Sources of water—springs and fountains—were valuable in themselves, but also held an important place in the religious imagery of the 18th and 19th century, in describing the spiritual landscape. The experience of grace entering the soul was often compared to the welling up of an endless, living fountain. Contact, while still in this world, with the life beyond death was felt to be an overwhelming, unmediated experience. It opened up a stream of life and joy that, until then, had been hidden under the interior landscape of the soul. It was another sanctified life, a blessed world, pouring itself out into this one. Finding the way to that source of life and grace depended on developing clairvoyance or on developing an open channel of communication with those beings—spirits—who had clairvoyant powers to see into the earth as easily as they could see into heaven. 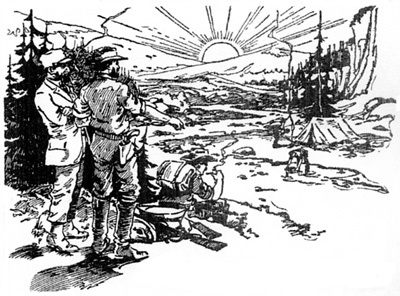 It is now claimed that the discovery of gold near Eau Claire [Wisconsin] was made through a spiritualist medium to whom the spirit of the Indian Chief Big Heart revealed the spot where gold was subsequently discovered. A problem arose in trying to locate specific material features on and under the earth that were supposed to correspond to the spiritual features one perceived. Imagine one’s entire body and mind turned into a witching wand, a divining rod, pointing toward something no one else had seen. When others excavated at that spot, would they uncover that particular something? What would it mean if they did, or if they did not? The spiritual and material—could they mix, or were they like oil and water? Abraham Jameswas born in Chester County, Pennsylvania in 1827. He moved often around the country as a young man, and took a variety of jobs—he taught school for a while, and then worked on the railroad as a conductor. During the California Gold Rush, he visited his brother in the gold fields. Abraham James [. . .] was away to the gold diggings in Sierra county, under the shadow of the Nevadas. In this rough region he found his brother tunneling for gold. He had already reached the distance of 1400 feet. The shaft was deep and the mountain above crowned in perpetual whiteness. Here was a wild region ripe for exploration and geological pursuits, and all leading under the guidance of exalted spiritual beings, to the future mediumistic work of Mr. James, in tracing subterranean water courses, and discovering oil veins and minerals. These hydraulic and extensive quartz mining operations presented new fields for observation and investigation. Mountains pierced like polished shafts the storm-clouds above. Measureless caves were beneath. Those vast amphitheatres, roofed with stalactites and decorated with spar and crystalizations, thrones and altars, spoke to his appreciative soul of the might and majesty of the Infinite. [. . .] While in this portion of California, he was thrown into the society of Mr. James K. Chandler, a young man of Quaker descent, possessed of considerable medium powers, who, introducing the subject of Spiritualism, handed him Andrew Jackson Davis’ first work, “Nature’s Divine Revelations.” This, a feast of reason, lifted him into new cosmic realms of thought, and opened the portal-doors of the universe. Diligently perusing, he clearly saw that nature’s outward processes, the mineral, vegetable, animal, human, all, in orderly method, demonstrated the existence of inward forces—divine formative potencies residing in all matter. Also perceiving that molecular deposits, chemical changes, geological formations, and all structures depended upon inherent forces, he clearly grasped the theory that this visible world was but the phenomenal exhibition of that superior spirit-realm which comprehends the energizing forces, the primal forms and the eternal laws of the Universe—the DIVINE LIFE in and over all things. —James Martin Peebles, The Practical of Spiritualism: Biographical Sketch of Abraham James, Historic Description of His Oil-Well Discoveries in Pleasantville, Pa., through Spirit Direction. Chicago: Horton & Leonard, 1868: 18-19. Moving to Chicago, James developed himself as a medium, and soon began to advise businessmen clients on investment opportunities, receiving instructions in trance and causing him to draw pictures of what often seemed to be geological strata. The spirits directed him to a spot on the West Side of Chicago, and told him that under the earth at that spot, a fabulously rich deposit of oil lay. He found a group of investors willing to rely on advice from spirits. They bored a well and many hundreds of feet below the surface struck—water. They had discovered the underground water table that still continues to supply pure water, gushing under pressure, to Chicago. The drilling company’s investors made the most of it, publishing a prospectus for other possible investors in various industrial facilities that would use the water—ice-making, paper-making, wool processing, and beer-making, among them. The spirits had directed them to this wonderful source of water, they wrote, as a demonstration of their existence and ability to communicate with humans. Did it matter that the spirits had pointed to oil, but the humans had found water? Oil and water were both underground flowing “treasures,” so in some sense perhaps it did not—especially if the investors were prepared to use the opportunity to develop the source of water, although the investors’declaration that the water supply was “perpetual” and “endless” seems like a projection of their belief about the eternity of the spiritual world or of the infinity of God’s grace, rather than an estimate based on empirical data (In fact, intensive tapping of the water reduced the water table considerably over the following decades). But although a wealth of water was produced, spiritualists who had invested in the “oil well” grumbled when no gusher of petroleum ever materialized. Adaline Buffum, a Chicago spirit medium and publisher of a spiritualist newspaper even published her written complaint as a pamphlet entitled History of the Spirits’ Oil Well, alias Artesian Well, near Chicago, and subtitled The Facts as the Spirits Gave Them; The Artesian Well No Demonstration of Spirit Power. Abraham James apparently made little money himself from the venture in Chicago, and eventually turned his attentions to the oil country in Western Pennsylvania. Of the ten or twelve thousand oil-wells bored in Pennsylvania, we are told that one thousand at least were located by diviners with a divining-rod, or with a pendulum made of a deerskin bag enclosing a ball of musk, or by spiritualists falling into trances and executing spasmodic evolutions when they felt the influence of the spots to be selected! —Schele De Vere, “The Magic Wand,” Appletons’ Journal, vol. 5, no. 112 (May 20, 1871): 591. In the oil fields, James had undeniable success. On farmland just outside Pleasantville, Pennsylvania, on practically the highest point in Venango County, James’ spirits communicated to him the precise location of a spot that would produce oil, and after boring more than eight hundred feet, the “Harmonial Well No. 1” did indeed produce oil. The spot was not entirely obvious. When oil was first collected and brought up from the ground ten years before, the wells were located around water courses—streams and rivers—on the belief that oil was flowing through the earth, and would collect, where water did. The site at Pleasantville was on a bluff, away from Oil Creek. A couple of years before James pointed to his spot, however, it was realized that the oil deposits were in layers that did not necessarily correspond to the surface topography, and that the deposits extended underground even across high points on the surface. As a result, a small oil boom occurred around the town of Shamburg in Clarion County, when oil was struck from wells dug at higher elevations than before. Although James’ spirits directed that a well be dug at a place that had not been tapped, it was not, therefore, completely out of the question. James and his investors—all spiritualists—did make money from the well and from others that he located and dug in the area. His success in the Pleasantville area created a small oil boom there. Pleasantville, Pa., Feb. 1, 1868. This morning, soon after breakfast, news spread like wildfire among the staid denizens of this pleasant village, that a new well had just commenced producing oil. With many others, we repaired to the scene, where, indeed, the so-called “spiritual” well, in the south part of the borough, was astonishing the throng with its production of oil. On inquiry, I learned the oil was first produced from the well about nine o’clock this morning, and near noon, when we saw it, was more than fulfilling the expectations of its immediate friends. It is claimed that this well was spiritually located by a “medium,” who, describing the operations, in a printed circular says: “I was, while passing along in a buggy with a friend, violently influenced and controlled by a power outside of myself. I was forced out of the buggy and over the fence, when I became entirely unconscious. I was then moved for some distance across the lot in which I was, and was stopped upon a spot which was entirely outside of myself. I was forced out of the buggy and over the fence, when I became entirely unconscious. I was then moved for some distance across the lot I in which I was, and was stopped upon a spot which was plainly marked out by the control.” We were informed by Mr. Farwell, of the firm of Farwell & Potter, who has put down the well, that its depth is eight hundred and thirty-five feet, that the last and fourth sand rock was eighteen feet thick, of which fifteen feet was white sand, and the last three feet was coarse and dark colored. While many of the more enthusiastic place a very high estimate upon its prospective yield, we think it prudent to say, having witnessed the Nettleton wells here in their beginning, (and now producing in their third year) that it will give a daily product of fifty barrels of oil and may be more. With this well as an additional fact, there is no longer a doubt that this locality is, and to be in future, permanent producing oil territory. True, it is to be obtained only at a greater depth than is usual elsewhere, but with the perfection of machinery and skill and experience in drilling, wells can now be bored here with about the same dispatch as a year or two since at the depth of two hundred feet less. So it is being verified, as I predicted two years ago, this locality is ripening into the head center of oildom. —“A Fifty-Barrel ‘Spiritual’ Well at Pleasantville,” The Titusville (Pennsylvania) Morning Herald, February 3, 1868, p. 3. Spirits might also involve themselves directly in finances, from materializing money to circulating it for philanthropic purposes. Being of late in the town of Wallingsford, Ct., Mr. B[rittan] and others formed a circle. While sitting, awaiting manifestations, a twenty-five cent piece was dropped, as it were, from the ceiling, and fell on the hands of one of the members of the circle. Its descent was witnessed by several. Then another twenty-five cent piece, emitting a shining light, was seen to fly around the room just as a bird would, from corner to corner. An attempt was made to catch the piece of money, but it was unsuccessful. Finally, after being seen by all present, it was taken by the invisible power out of the opened door and deposited in a place unknown. One of the circle was a gentleman of the second advent church. After the manifestations had been made, he stated that on a certain occasion he himself had taken from his hand by unseen agency a six-cent piece, and was impressed at the time for what use it was appropriated—to buy a loaf of bread for a poor widow. The question was here asked if this impression was correct, and a response was made in the affirmative. On one occasion the same gentleman had a ten-cent piece deposited in his pocket by, as he believed, spiritual agency. These experiences he had lately announced publicly to some of his congregation. —Samuel B. Brittan, “Spirits Circulating Specie,” Spiritual Telegraph, April 23, 1855. The spirits might also give investment advice, using their powers to distinguish trends and predict the future, to allow their clients to make money. Many mediums and clairvoyants had business customers who relied on them for investing and business counsel. Semantha Mettler, for example, spent most of her time using her “magnetic” powers to heal the sick, but she also had a roster of clients who consulted her spirits in matters of business—Alvin Adams, the highly-successful founder of Adam’s Express, for example, the nineteenth-century counterpart of Federal Express, was Mrs. Mettler’s client. Through her, Adams talked with the spirits of Alexander Hamilton and Daniel Webster. Cornelius Vanderbilt appears to have benefitted from the “insider” information about stock price manipulations passed on to him from Victoria Woodhull, not from the spirits exactly, but from bankers Jay Gould and Jim Fisk. With her share of the profits, Woodhull opened a stock brokerage firm, and when that prospered with the help of Vanderbilt, she and her sister Tennie began publishing Woodhull & Claflin’s Weekly. Some people, however, found the advice and predictions of the spirits to be suspiciously vague, and unusable as a basis for making a profit. But some said that the spirits were deliberately vague about information that might contribute to private profit, individual gain, or market manipulation. Why? Because they were essentially Socialists or even Communists, holding all things in common. In Heaven, where everyone is clairvoyant, speculation on future events or on the quality of goods is impossible. All information about the “market” is instantaneously and fully available to everyone. Instituting the reign of Heaven on Earth would therefore mean that the present economic system would have to be overthrown. Seth Painewas a spiritualist who was active in a range of radical causes—the abolition of slavery (he hid slaves on the Underground Railroad), free love, and most especially, the socialistic economics of Charles Fourier. He moved from Vermont, when he was a young man, to the Chicago area and helped establish the town of Lake Zurich, Illinois. He published a newspaper, The Christian Banker, in which he castigated at length the capitalist system and, especially, its practitioners in Chicago, the banks in particular. One of his spiritualist acquaintances was a wealthy merchant, Ira Eddy, who had funded the building of Harmony Hall, a meeting place in Chicago for spiritualists. Paine and Eddy entered into a partnership to open a bank, which they named “The Bank of Chicago.” They intended it to run on progressive, spiritualist principles, including rules of lending that were unusual, to say the least: They refused, for example, to lend money to tobacco smokers, or to people who intended to speculate on land or commodities. Paine printed his own private currency—“shinplasters,” as others called it. The Bank of Chicago soon felt pressure on its reserves. Paine’s editorial corruscations did nothing to endear him to his fellow bankers in Chicago. Nor did his competitors fail to notice that his lending rate was generally two or three percent below theirs. In the fall of 1852, a “Bank War” commenced in Chicago, in which the larger, more established banks put as much pressure as possible on all their “wildcat” competitors, including the Bank of Chicago. The Grand Jury in Chicago indicted Paine (and others) for running illegal banks. The larger banks then refused to honor Paine’s bank notes, presented to them by their own customers, or they immediately sent them over to the Bank of Chicago for redemption, increasing the pressure on the bank’s precious metal reserves. Paine, as owner, and Eddy, as chief financial backer, faced a tense situation. It did not help matters that they had involved the mediums of Harmony Hall in the business affairs of the Bank (Harmony Hall was upstairs, the Bank was downstairs). These unofficial bank officers appear to have fed Paine’s and Eddy’s paranoia about corporate and family conspiracies against them, and to have added a note of delusional strangeness to the climaxing moments of the Bank of Chicago. April 4 : A course of lectures in Chicago; did not pay expenses; for the excitement created by Seth Paine and Ira B. Eddy had laid the spirits, for a time, and the Lone One could not raise them or the dead people, and of course he went out of the city minus dollars and words. But he knew this gospel had to be preached at somebody’s expense. April 8: In Waukegan, but, alas! Seth Paine had been there, and some persons, accustomed to magnifying trifles, told large stories on small capital, and what was nobody’s business was attended to by everybody, as usual—a sort of change, for nobody usually attends to everybody’s business. —Warren Chase, Life-Line of the Lone One, 190. Eddy’s and Paine’s reputations eventually rebounded. Paine was remembered after he died for his founding of Lake Zurich and for the philanthropic efforts he made on behalf of educating the poor of Chicago. It should come as no surprise that when money came into the picture, some of the worst in human character began to appear alongside. When the spiritual intersected with the material in the form of money or gold, the spirit often took a downward turn into fraud, bunco, blackmail, grand theft, and even murder, the stuff of lurid imagination, come to life. Humans could drag the angels down to earth, at least as easily as the angels could lift humans up to heaven.